Do you know of any other building that so strongly evokes an aquatic sensation? Don’t miss out on a radiant world of water and light that cannot be experienced anywhere else. 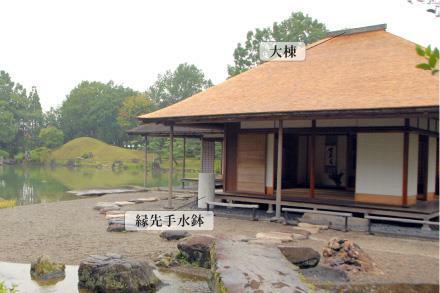 A large pond (about 2,300㎡, 1.8m/deepest point) lies in front of the mansion.The view of abundant water extending from the pebble covered veranda is very unique to the Yokokan Garden. 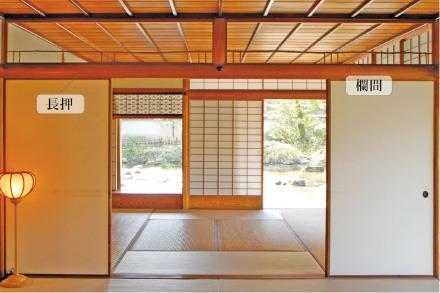 In Gozanoma and other tatami-sitting rooms, thin (9.39cm across) Migakimaruta or Menkawabashira are used to produce a bright and relaxed atmosphere of the sukiya-zukuri (traditional tearoom) style architecture.A wide space under the large eave creates a relaxing ambience. The eye level view of the garden has been preserved. A unique approach was taken to reconstruct the buildings in this garden. They were built directly over the remains so that our eye level view of the garden is kept as it was in the past. The garden and buildings are perfectly arranged. 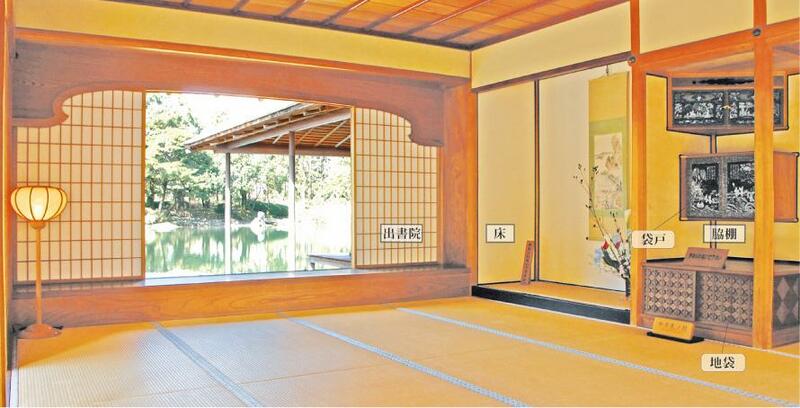 The scenery of the garden framed by window sashes and doors of the buildings is magnificent. The ceiling was built in the style called “Saobuchi-tenjo” in which thin boards of Sawara cypress are placed and held with lacquered rods. Beams are made of cedar trees. A transom placed between Gozanoma and Otsuginoma is made of unhusked thin round logs of the Yamaukogi tree, creating a refined simplicity. 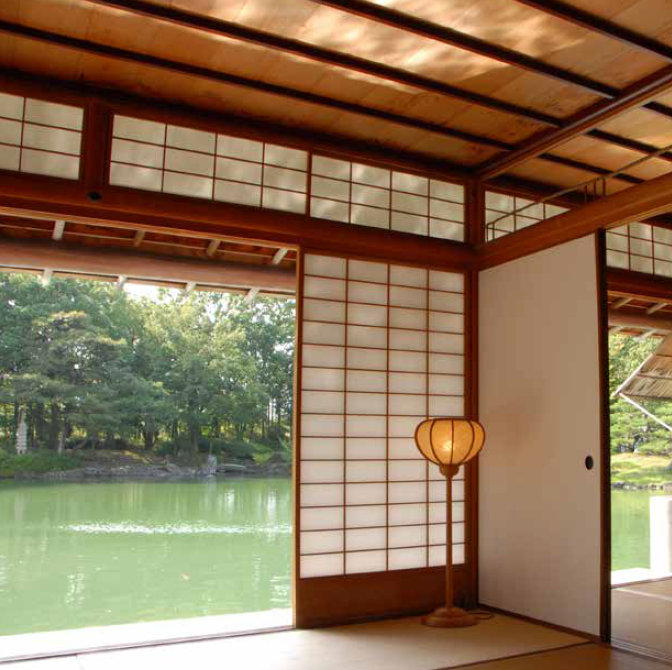 The sunlight reflected in the pond flickers on the ceiling or the paper wall of the room. It adds vibrant color to the natural beauty of the building structure. A Shakudani stone mined from the Asuwa mountain is placed on the top of the roof. Second home of the Echizen Matsudairas, the former feudal lords of the Fukui Domain.The world of “Wabi,” refined simplicity, exists here. GOZANOMA: Lord’s Audience Room　It is the main room of this mansion. The name “Gozanoma” comes from the fact that feudal lords would stay here. There is a decorative alcove and a side shelf on the east wall, and the De-shoin attached to the south side. An alcove pillar is made of chestnut and an outside stile of the alcove is made of Japanese horse-chestnut. The side shelf consists of a cupboard on the floor and staggered shelves. The wall is made of paper. 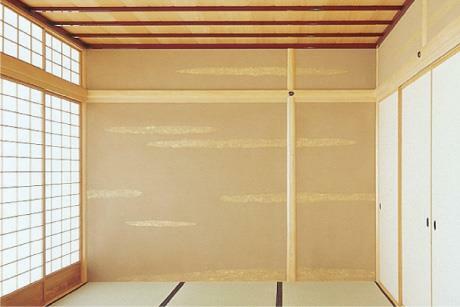 Ten pieces of Echizen Fusuma paper are layered to make the wall and finished with Echizen Torinoko paper. De-shoin, an attached study section, is made up of a built-in desk (218.16cm wide), translucent lattice work sliding doors and a hemp leaf designed wooden louvered transom. Refined art such as this exquisitely detailed openwork ranma (a type of transom) made from a single plank of mulberry wood, appear throughout the Yokokan. OTSUKIMINOMA: Moon Room The mansion extends from north to south. This room is located on the south end of the mansion, where the garden stream flows. Here we can appreciate a view of the garden from three directions. 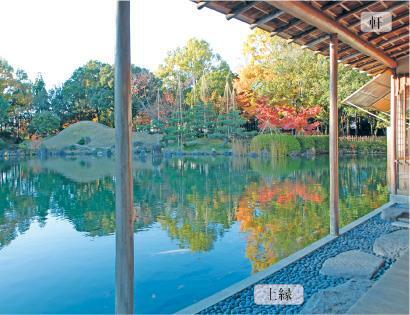 With the garden extending an additional 9 meters to the east at that time, the east and south openings allowed the lords to enjoy the view of the garden stream. Today, we can still enjoy the view of the gentle stream flow on the pebbled shoreline and a natural stone bridge. From the moon-viewing veranda attached to the east side of the room, rising-moon and the moon reflected on the water flow could be appreciated. From the western side of the room over De-shoin, an attached study section, we can enjoy the moon at dawn reflected on the pond. 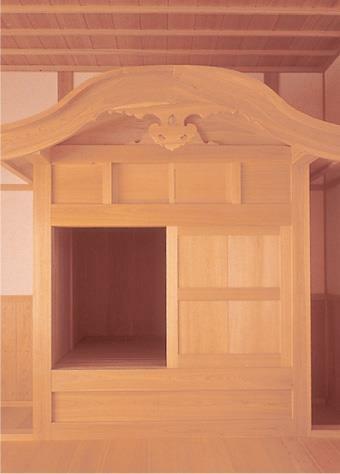 The upper part of the De-shoin is made from one piece of Japanese zelkova wood shaped in the form of a cloud. The view of the garden through this opening is one of the most impressive in the garden. The upper cupboards in the side shelves are inlayed with mother-of-pearl. KUSHIGATANO-OMA: Comb Room The window facing the pond has a flame-shaped design and it evokes the image of a Japanese comb. The name of this room derives from this design. Of all the rooms in the mansion, this room protrudes furthest into the pond. When you sit beside the window, you feel as if you were on a houseboat. Flap wooden shutters add some flavor to the scene. It is designed to create a sense of openness.Two polished cedar logs and an un-stripped magnolia log are placed alternately in the ceiling and the eave. ※【Katomado】The upper part of the windows have fire flame designs. This type of window was imported from China as one of the special Zen temple architectural styles in the Kamakura Period (12C-13C). 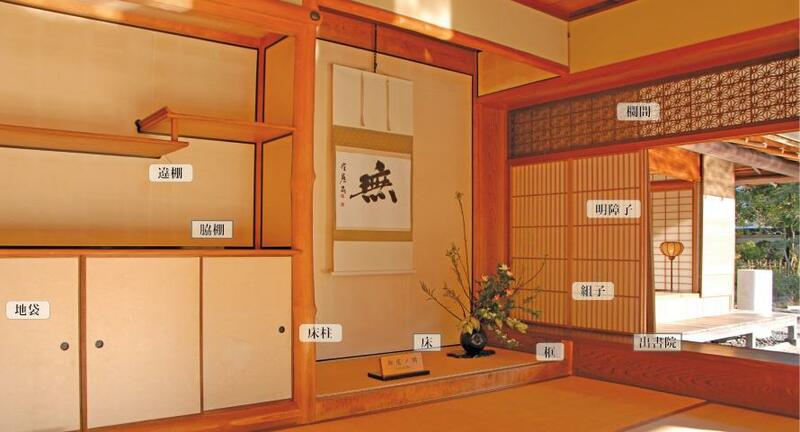 The name “Kusari” derives from the chain used to hang a tea kettle as well as the fact that the room connected the tearoom and other rooms of the mansion. There is a sunken hearth near the wooden door. There is a shallow “toko,” a raised platform, and cupboards bending around the northwest corner of the room. 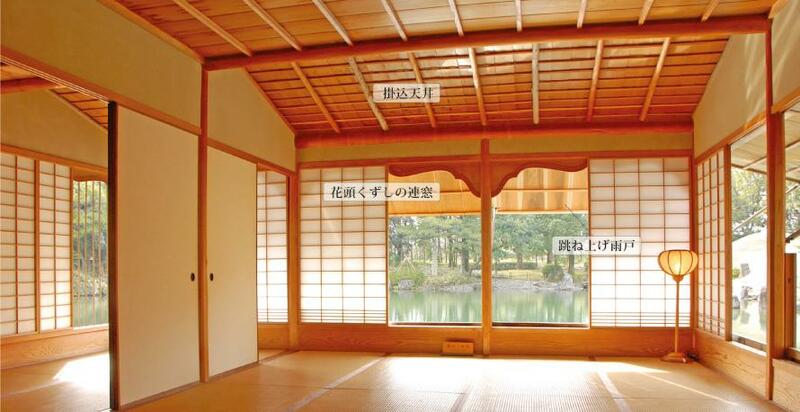 The east half of the room facing the river stream has a “Kakekomi-tenjo” ceiling. 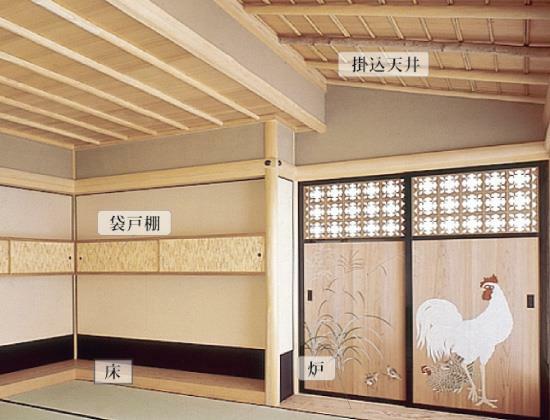 The inner sides of the wooden sliding doors have a painted rooster. We can detect a rooster in an old photo, however; the paint came off too much to see the entire painting. The original state was guessed and restored it. The outside of the doors have bamboo wickerwork. This room was named so because its walls were sprinkled with gold dust. It is believed that this room served as the official entrance to the mansion. The bathroom area, consisting of a steam bath and a relaxing space, accounts for a large percentage in a whole building space, meaning that this mansion was built for relaxation. Unlike zashiki (tatami sitting room) space, this space is made entirely of Japanese cypress. The pillars are 12.7cm-square. The bathroom and relaxing space are placed over the inner pond which has an irregular pentagonal shape. The floor of the bathroom is slightly inclined toward the center so that used water can be drained into the pond below. The fire place behind the steam bath was not reconstructed, however; a ventilation hole was made in the roof based on the descriptions in the old document. 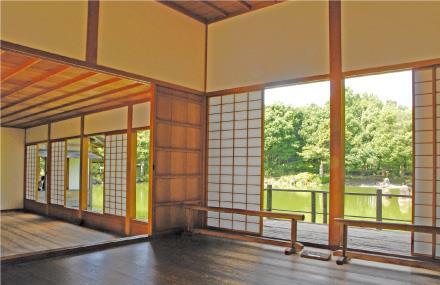 A balcony with bamboo duckboards is attached to the west side of the relaxing room, facing the pond. From here, the front of “Seiren” can be seen across the pond, while the Fukui Castle Keep was supposedly viewed in the back. The hallway connecting a bath room and sitting room area is located slightly easterly to the centerline of the mansion, and arranged obliquely. It indicates that the two areas connected by the hallway hold completely different spaces, but are smoothly connected. Designs on the floor cupboard are very unique, and different on the south side and east side. 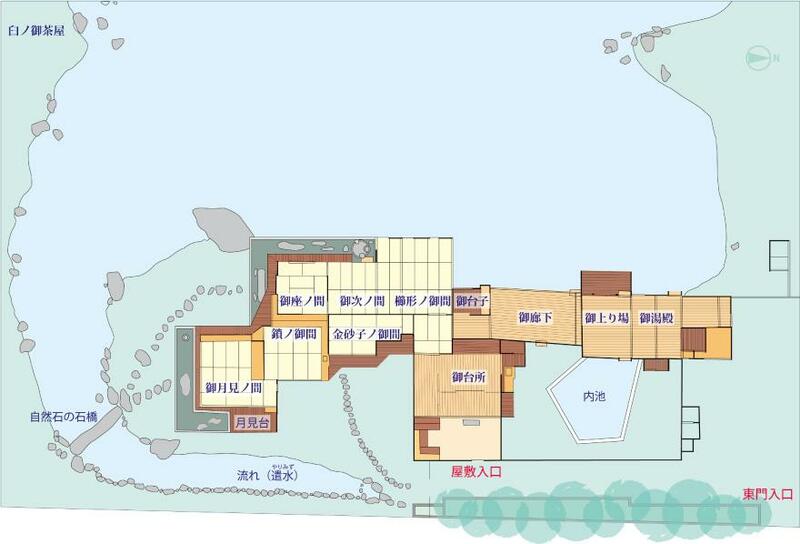 Since the south part of its foundation is under the road, the tea house can only be seen on the floor plan. 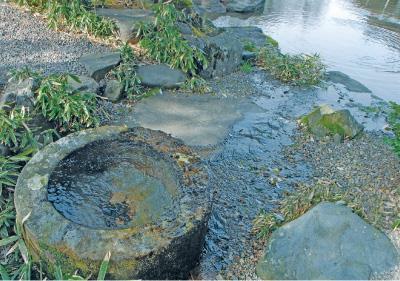 There is an original wash basin made of Shakudani stone with spring water pouring out from it. It is quite big with a 90cm outer diameter. 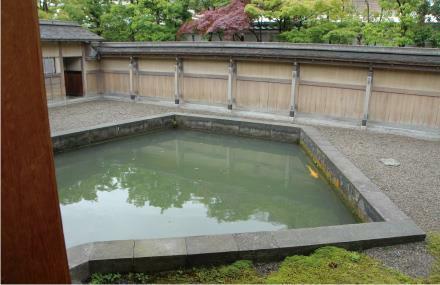 The name “Usuno-ochaya” is possibly derived from this wash basin, Usu in Japanese. 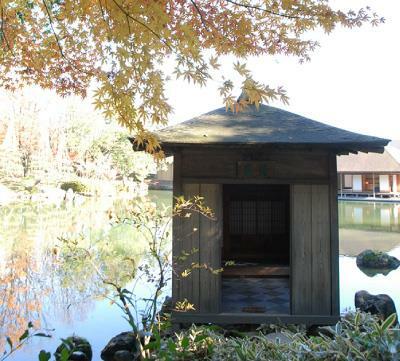 It is a Shotei (small arbor) named “Seiren,” which is made entirely of zelkova wood, and well matched with the stone work of the pond. 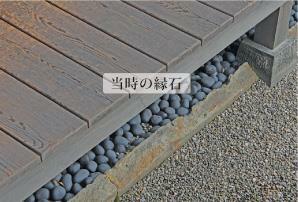 It constitutes an important element in the landscape of the garden.